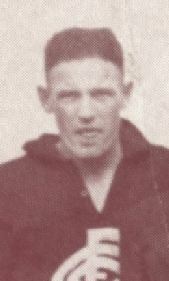 Kevin Fox who was born in Brunswick, spent three seasons with Carlton leading up to the outbreak of World War II in 1939. He was recruited from Brunswick CYMS, and made his senior debut in round seven of 1937 – by coincidence, the same match that launched the career of Blues legend Bob Chitty - against Footscray at Princes Park. It was a memorable day all round for the well-built follower-forward, as the Blues crushed the Tricolours by ten goals. Despite that auspicious beginning to his career, Fox found it difficult to hold a place in a strong Carlton line-up from then on. After two appearances in his first year, he played another six matches under the Blues’ new captain-coach Brighton Diggins in 1938. Even so, he wasn’t part of the finals campaign that brought the keenly-awaited Premiership to Princes Park at last. One of the reasons for Kevin’s lack of opportunity could have been that he preferred to play as a key forward, while Diggins believed that he was more valuable as a follower. So, somewhat frustrated after 12 games for the Blues, Kevin requested and was granted a clearance to Fitzroy. On the eve of the 1939 VFL finals, Australia leapt into World War II when thousands of young men volunteered to serve in the armed forces. Among them was Fox, who played only a handful of games for Fitzroy before he was called up in June, 1940. Thankfully he survived the horrors of the war, and had been promoted to the rank of Warrant Officer Class 2 with the illustrious 2/23 Battalion by the time he was discharged in September, 1945. In 1946, after five full seasons out of the game, Fox resumed his VFL career at Brunswick St. He was offered the role of a permanent forward at last, and did well even though the ‘Roys faltered to a mid-table finish. He was approaching 30 by the time that season concluded, but his 22 games and 32 goals in two interrupted seasons for Fitzroy was a valuable contribution. Fox passed away on the 6th September, 1993 aged 75. "CPL.KEVIN P. FOX wounded in action, was in the Fitzroy football team until he enlisted last June. He had previously played with Carlton coming from the seconds in 1937 and playing 2 games that year, 5 in 1938, and 2 in 1939. He played 6 games with Fitzroy. He sailed with an infantry battalion in November. He was it's light heavyweight champion and captain of it's football team. He is 23 and lived at 100 Gold St., Brunswick. Before enlisting he was an operator at Holeproof Pty Ltd."
Contributors to this page: blueycarlton , pblue , Bombasheldon , PatsFitztrick , tmd1 , molsey , dgreen2 , TruBlueBrad and admin . Page last modified on Sunday 27 of January, 2013 15:26:36 AEDT by blueycarlton. 1988 Rd 11 - What a game by Bradley & Blackwell. 1994 - Jacob Anstey & Aaron Hamill draft targets (14/09/94).